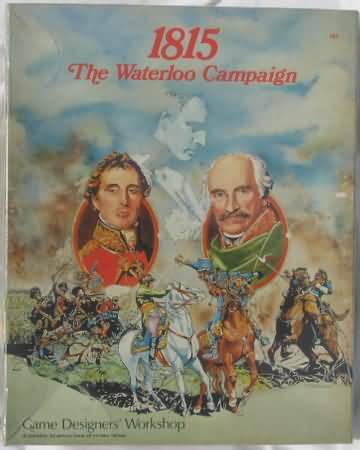 This is a simply a light look at all the Waterloo campaign games I have owned and played over the years. I have tried to include just about anything with at least some campaign element to it, but pure recreations of the climatic battle are not present – so no Wellington’s Victory or The Thin Red Line etc. Furthermore, I am not going into any deep detail as to how the qualifying games are played. 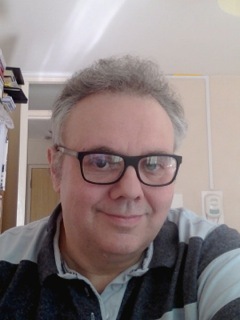 What I am looking at (chattily) is how these games reflected (or failed to reflect) the issues in my Waterloo as an Utter Waste of Time article – that is, operational manoeuvre room, the issue of time, the weather, and command and control. One of the oldest historical wargames, and just the third board wargame I ever owned. As a boy, I travelled into London’s West End all on my own at the very end of 1972, armed with some extra Christmas money. With it I bought Waterloo, got it home, got it open, got it punched, learnt…and then got disappointed. Perhaps I was not helped by the utterly rotten film on the television, but any sense of seeing something that played like something from the drama of June 1815 was pretty much absent. Looking back, I can affirm that the game had a map you could wander about on, but weather, command, and the time drag of military events happening or not happening was utterly absent. And with the map, no one I ever played it with ever moved their armies like Napoleonic armies, and thus you invariably ended up with a long line of blue units pushing against a long line of green and pinky/red units, with everyone knocking off for the day bang on five – that is when each day’s time track abruptly ended…in the month with the longest days in the year! But of course I played it, repeatedly and devotedly, because it was the only thing on the subject I had for several years. And so it got indulged until the counters faded and the black tape fell off (well ripped off) the back of the board. And if I see a copy now, all it does it make me feel old…and recall Roy Wood and Wizzard, Marc Bolan, and girls in hot pants. Christmas 1976 – the film Waterloo was making its British television debut on the evening of the 25th, and my family was having a mass festive knees-up at our London home. I wanted to watch the film, but downstairs the Comben residence was filled with everyone from near and distant family to neighbours from around the street…and Party Sevens and bowls of crisps and peanuts, and a great cloud of toxic cigarette smoke, and stacks of 45 singles ready to drop on the turntable, and turkey sandwiches, and sausage rolls, and great big shirt collars and hair styles for the younger blokes looking like variations on a samurai’s helmet. I kept upstairs the first part of the evening and watched the film in stunning low definition black and white. But my interest was kept seriously attuned to events by the presence beside me of one of my three Christmas wargames (if you know what the other two were, you must have been there), towit, Napoleon’s Last Battles. 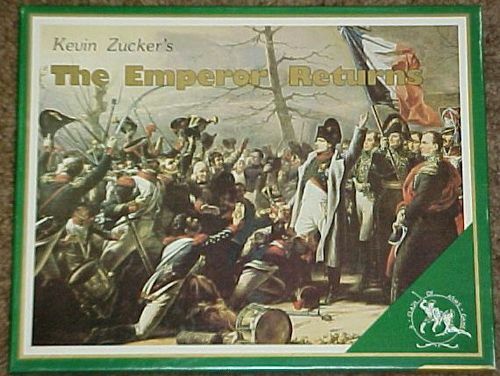 This could be played in its littler bits as, well….Napoleon’s Last Battles. On the other hand, you could put the four maps together, sort out the OOB, and play a three day (actually two and a bit of a day) campaign game. Compared to Avalon Hill’s Waterloo, this was a serious move on – not that much more complicated, but possessing nearly all the right things. First of all, French army command had to be kick started each campaign morning after the 16th. Until Napoleon himself stirred, precious little else could get going. The indifferent qualities of Napoleon’s erring subordinate, Marshal Ney, were highlighted by gruff nuts’ inability to lead more than one formation at a time – he could something, but never everything. There was no actual loose cannon effect however. As to other issues, the rain certainly did arrive in this game, and from what I can remember, it slowed units and prevented artillery bombarding otherwise promising targets. But this was a game that was very much what I would call “the fight at the end of the funnel.” You began with everything set up for Ligny and Quatre Bras, so, by Jove, that was what you were going to have. And there was precious little territory west of Quatre Bras, and only two and a half days to win or lose everything. 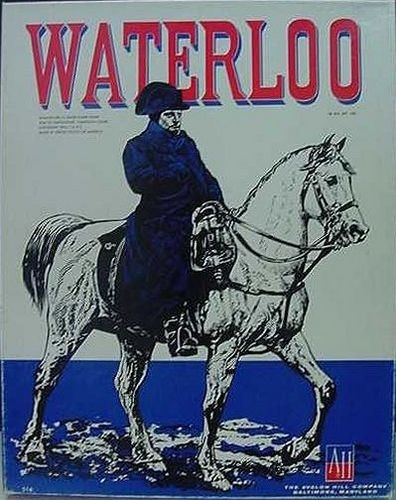 And with nothing west of the historic Waterloo position, in all probability, if things were not decided clearly on the 16th, it was Waterloo you were most likely to get, as there was nowhere else to go…and no time to get there anyway. I was at University when I caught up with this one. I did try hard to like this it, with its shock-capable cavalry, blown cavalry markers, and its bombarding artillery set-ups, but it never worked for me – not even when, recently, Gilbert Collins did a video which pointed out all its best points. But it was another funnel game, and unlike NLB, it seemed to me stodgy and ill-paced. If I remember correctly, one little nuance it did have was randomizing what might be lurking at Quatre Bras at game start, thus giving Ney some genuine food for thought as he faced some inverted mystery counters. But you could never “Go West Rash Man” because there was nowhere to go, and this combined with those good ideas turning into dragging procedures just failed to work my dice. It also had some rather unappealing components, in my opinion, clear but utterly bland, so I must confess, in the end it was just left to gather dust. Now this game had near everything – command issues, scouting and screening cavalry, operational and tactical blends, weather, a decent timescale, something west of the Brussels /Charleroi road…and all of it presented on a wacky large hex map. Pushing forty when I nabbed this goody, I was coming back to the hobby after a period of absence lasting a fair whack of years. I more or less immediately recognized the similarities to NLB, but only rather later cottoned on to the two games both being designed by Kevin Zucker. Oh dear. Could I criticize it? I do not really want to because this was a clever piece of work that combined so much relevant colour with genuine ease of play. True, it needed a revised set of rules, but this was really the first time I felt like these were 1815 armies moving realistically on the operational level and fighting realistically on the tactical level. As such, the necessity of preventing the two Coalition armies joining was played out in a historically faithful manner. You even got a pontoon train! Looking back to my earlier article, time was certainly an issue in this game – and daringly and adeptly done. Turns were great chunks of daytime (morning, afternoon, evening – I think – and night.). Your big battles might therefore only last a couple of turns, or maybe three, but this worked alongside a very neat battle engagement system which made it very difficult to keep throwing the same units into the fray and expecting them to look interested. The one negative was the map – in my opinion. Big hexes are all very well, but to compensate parts of the map detail looked plain odd – bends in roads where there never bends in reality, but it was the only way to make the terrain stay more or less where it should. Perhaps areas would have been better, and I must admit to being one of those gamers who think areas should be employed in map design far more often. Another Kevin Zucker design, following in the operational tradition of Napoleon at Bay, 1809, Struggle of Nations, and others too numerous to mention. Two things really dominated the design mindset of this series – logistics and army command. You could not simply push all your pieces to wherever you wanted them to go – you had to issue orders from a Centre of Operations (best placed on the best bit of road you could find), or else rely on the subordinate commander’s initiative to move without directions coming from above. And every time something or someone moved, there was a danger that someone or some things would fall by the wayside as march attrition took its toll. 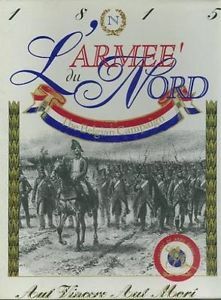 Given the smaller distances and timespan of the 1815 campaign, this was not so much of an issue as in other campaigns, but then again, the game covered a far greater period of time, with the French army’s shift to the border catered for, and then potentially weeks of manoeuvres following after. You could play with fog of war, and this tied in with a map of nearly all of Belgium and a chunk of northern France, enabled the French to opt for a completely different approach to the historic one. L’Armée du Nord might make its main thrust further to the west, thus threatening immediately the Iron Duke’s communications with Britain; or, alternatively, you could find Boney moving further east, to imperil Blücher’s lines of communication with the Rhine. The choice was wide open, and so the battles on this 1815 rerun might well occur far away from Hougomont’s woods and Ligny brook. Inevitably though, in this system, which stressed that what went on pre battle was at least as important as battle itself, the battles you saw on your map were fought with a very broad brush – not without style or consideration of battle factors such as cavalry finishing a rout, or the French Grand Battery, but not ever a battle “in little” as other designs might seek to attempt. Weather? Well that was certainly present, but I felt it was not quite right. The game insisted, as I recall, that it was going to tip down on the 17th as it historically did. But, given how many other what-ifs you were working with, and how much Belgium you could be in, I always felt that this game needed to be less set about when the bad weather came, if at all, and where it fell…if it ever did. Oh, and where was I when I got this game? At home, waiting for the parcel to arrive. This was essentially a Kevin Zucker operational model tied down to the actual Waterloo campaign territory. It came in a tiny box, with a tiny bland map, utterly unremarkable units and a totally unappealing rulebook. Nevertheless, all the orders and logistics/admin stuff was there, but sometimes you cannot overcome disappointing components and a sense that this is the wrong game in the wrong format, lingering away in the wrong box. I played it a few times at uni, and it then followed me home looking for love – but thirty years on, it still has not had any. 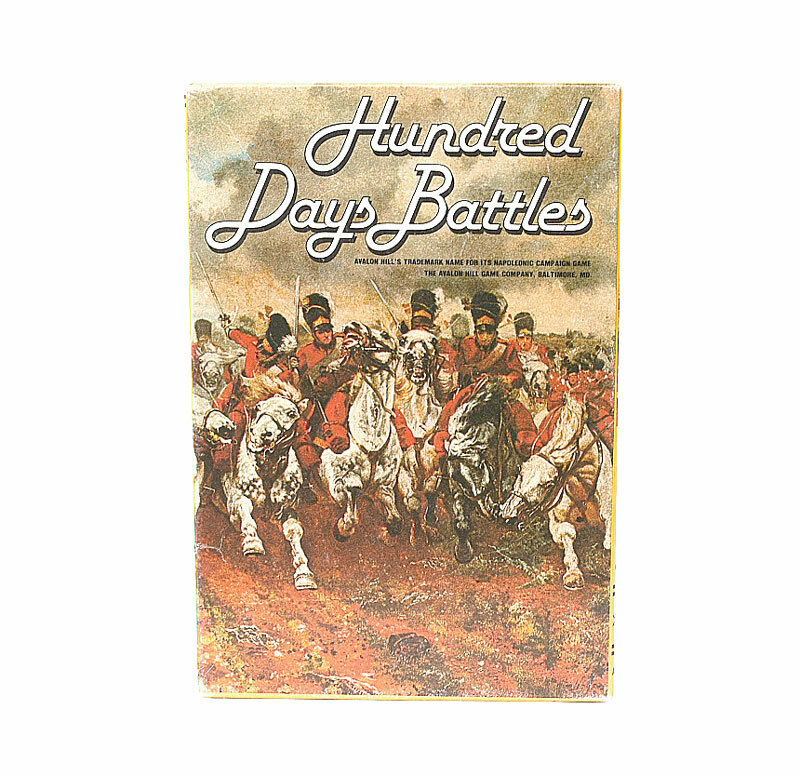 Just in terms of physical size, the biggest game on the 1815 campaign. It still pertains to the actual history, but the amount of room around the actual lines of advance and retreat opened up broader options. As I recall, I got this game in a London shop, where, having money to spend and wanting to spend it wisely, I spent ages in this large basement area (where the wargames were) prompting the owner to come down and make sure I had not collapsed or something. The game had weather, a sense of time and command, and a neat effect of distinguishing some casualties as men shook loose from units as stragglers or lightly wounded, from those who were clearly never going to prime a musket again. Perhaps the biggest issue with this game was its sheer physical size – you could play the whole campaign on three maps, or go for a specific day (guess what the choices were) where two of the three maps were in play. I never had room for three maps, and barely enough table space for two. As a Clash of Arms game it was attractive, but plain too big for me. Maybe others could cope, but I am tempted to say this was another game where working with a map divided into areas might have condensed things down whilst keeping options open. My most recent campaign acquisition, and talking of areas, this is a game with an area divided campaign map. You move your forces on this, with a reasonable amount of room off the historic beaten track; but when it came to battle, you moved everything onto one of a number of battle mats, which contained, depending on the location, actual or representative terrain of the sort of area you were in. If you want to talk about time in this game, it is hard not to turn the issue of time into a look at the two speed nature of the design. This can be problem with games which seek to do things two different ways – sometimes the two levels marry well together…and sometimes they do not. Avalanche Press’ copious range of naval titles, for example, combine an operational level and a tactical battle system, which, despite its broad strokes, is still reasonably involved. The problem with Fate of France’s two tier system, at least for me, is that the battle tier has not got the scope it needed and can feel like a poor man’s simulation of anything that could or did occur. In plain terms, the battlefield maps are a tad too small, and, surprising for an L2 product, the battlefield graphics are utterly uninspiring. In a sense, it rather negates the ease of area movement at operations level to then have to nudge and squeeze the attractive units onto small unattractive maps. For me, bogging the game down with a fiddly, awkward battle provision was not the way to go. On the other hand, the rules are pretty straightforward, and many of the right elements are present…even if the box does not fit anywhere. This would have been my most recent 1815 purchase in its deluxe form, only I already had the game from some years back in an earlier Columbia version. Like The Emperor Returns, there are a great many options for the French advance as the map covered a good amount of Belgium – albeit, in its earlier form, on a map of such limited proportions it could have been mistaken in some countries for a stamp. Well, that is a bit of an exaggeration, but it was not a big map, so the new version was worth getting if only to put my broad sweeps on a broader operational canvas. Of course, from certain perspectives, this game could be ridiculed for its notable list of missing “essentials.” There is no weather; no real sense of command and control other than a basic limit to how many “group” moves the different armies can make in any given turn, and the battle system never seems to run out of Q&A prompts. But dammit, this is the game which did fog of war better than any other game in history – it helps that this is the “Campaign Daddy” of all campaigns, with tension and consequences abounding. Furthermore, whatever the quirks of the combat system (which now includes an abstracted provision of terrain) it does marry well with the operational pace of the broader gameplay, and was surely a better model for how things might have been done in Waterloo Fate of France. To put it plainly, this is still the best 1815 campaign simulation out there. I do not care what it does not have, because that is utterly secondary to the beautiful simplicity of a game that highlighted the essential campaign quandaries of all three armies. Next year we will be at the bi-centennial of Waterloo, and naturally the mind turns to what 1815 offerings the hobby will delight us with in…2016…or 2017. There is surely plenty of scope for something really special: something that will marry time pressures to command limitations, and add weather, fog of war, drama and panoply. I just hope whatever arrives, whenever it arrives, is not too big, too complex, vexing, two paced,…the campaign, duly realized, will do enough of that in itself. 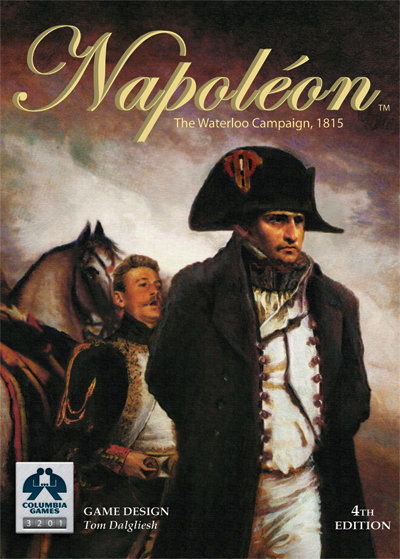 Posted in Waterloo Games and tagged 1815, Hundred Days, Napoleon, Waterloo. Bookmark the permalink. 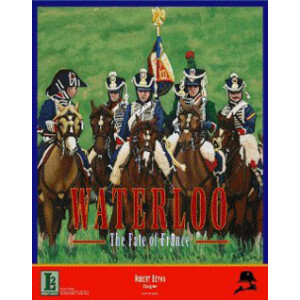 i also have ah waterloo could never find an anyone to play so it just sat.i still have this game today. The General did a rather good article many years ago which finessed the old classic rules to give far more tactical detail – near enough up to the standard of Last Days of the Grande Armée. You had squares, step reduction, and various other quality additions. You might well find it in the magazine’s archives. Did you miss out on the Airfix Waterloo Wargame? One of my best childhood Christmas presents ever! Sorry for the very tardy reply. Yes, missed out on that one. 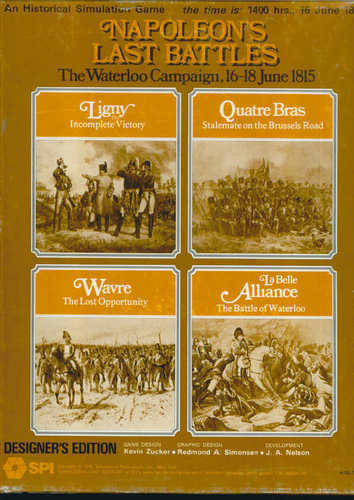 Avalon Hill’s Waterloo was easy to learn and provided three days of battle from Genappe to Quatre Bras, Ligny, and Wavre. The Infantry, cavalry, and artillery had proper names and formation sizes. ‘Twas an education…could run a bit long to play…was often a near run thing.